Eastasiasoft Ltd. (say that five times fast) have unveiled their next game, a top down explore-em-up set in the Bermuda Triangle titled Lost Sea. Naturally no island paradise is complete without at least one creepy abandoned temple to explore. Plane crashes are bad. Plane crashes that result in you stranded on a desert island are worse. Plane crashes that leave you stranded on an island in the middle of the Bermuda Triangle are, naturally, the most horrendous thing possible. Well, short of perhaps a plane crash that results in your fiery screaming death. In Lost Sea, this is precisely what happens to you. The Bermuda Triangle thing, not the fiery death one, though unless you keep your wits about you a fiery death could still very well be in your future. You, as the unnamed protagonist (complete with three days’ beard stubble and hawaiian shirt, of course,) must set off on an adventure of isometric proportions as you explore the procedurally generated landmasses of your own little tropical archipelago, finding friends, enemies, and equipment on your quest to escape the Triangle before it’s too late. Lost Sea claims to be a top down isometric strategy action game, but watching the gameplay trailer and checking out the game’s description on its web page seems to suggest more influence from the likes of Zelda or even Diablo than any typical strategy fare. From your isometric view you will explore procedurally generated islets and landmasses, finding crew and parts to build your very own ship, all while enjoying the game’s lush cell-shaded 3D visuals. 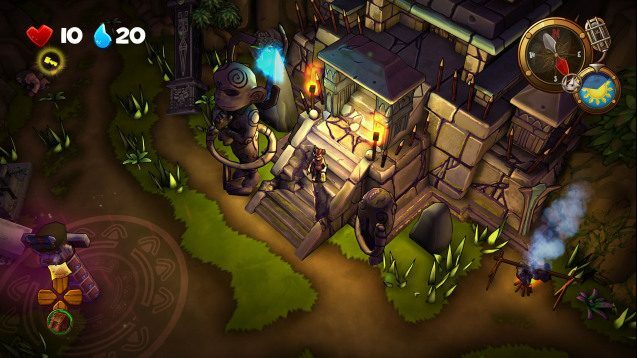 Lost Sea is aiming for a release some time in 2015 on the PS4, Xbox One, and on PC. If you would like to see more information on the game, feel free to visit its Steam Greenlight page, and even vote for it if the mood strikes you.